A few weeks back I wrote about my Sony RX10 and how it had to be repaired. The front element had a problem with mould growing on the inside and given the front element is part of a sealed unit ,the entire unit had to be replaced. Rather than use a Sony repair centre I opted to use The Real Camera Company in Manchester. These guys really know their stuff; I purchased my Bronica SQAi kit from them about a year ago. Having received my repaired RX10, I have been unable to test it properly due to a combination of the weather, a trip to Madeira and having too much work on. At the weekend though I decided to take a walk in the Peak District and took the RX10 along in the hope of giving it a try. As it turned out, the weather wasn’t that good, clouding over quite heavily, and I didn’t shoot any great images. The image at the top of this page is probably the best. What the trip did allow me to do was evaluate the replaced lens. In short, I’m very pleased. It’s as sharp as my previous lens and I’m confident that the results are much better. The corners are still a little soft, but the central part of the image appears excellent. The other point that I noticed is that more distant detail is now being retained better than with the old lens. Previously, you could see the finer details such as grass and rock turn soft. Now this isn’t noticeable. I’m feeling very happy about my decision to have the camera repaired – it was certainly cheaper than replacing it. Could I do without the RX10? Yes. Do I want to? No way, it’s a brilliant camera and perfect for a walk in the countryside. Misty morning in the trees at the Roaches. Fuji XT2 + 16-55 lens. If you are a regular reader of my blog, then you may well be aware of the problems I have experienced with my Fuji 55-200mm lens. Following some rather odd results, the lens was returned to Fuji back in November who couldn’t find any problems. Wex then returned it for a second time following a review of some test images as they agreed, there must be a fault. The lens is still being inspected by Fuji but Wex have kindly allowed me to trade it in against another lens. This is a huge help as being without a good telephoto lens means I can’t use the Fuji kit properly and always end up taking a second camera with me. Thanks to the trade in I now have the Fuji 50-140 f/2.8 + 1.4x Teleconverter and this weekend was my first outing. Unfortunately, the location we chose was very foggy and remained so for most of the day. The fog did lift to a certain level but generally it was too dense to use the new lens properly. 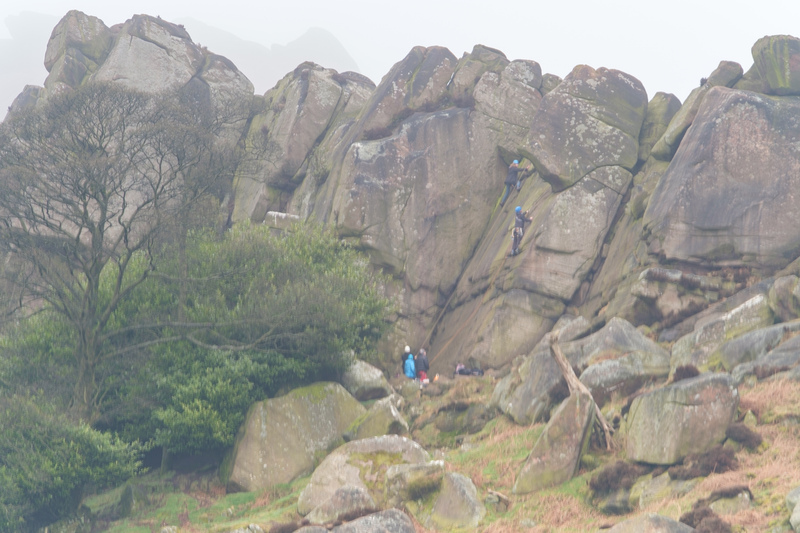 I did however manage a few test shots of distant rocks which a group of climbers were scaling. I mounter the camera on my tripod and lined up the shot using both the lens and teleconverter. The conditions were still with no wind and I was using a cable release. To my horror, when I zoomed in to check the image I could see a lot of camera shake and the image was blurred. I tried again and again but I couldn’t remove the shake. I then tried removing the teleconverter to see if it was the cause of the problem but it wasn’t. The results looked very much like those I experienced with the lens I had returned. Below you can see one of the problem images. Notice how the shake isn’t consistent across the frame and some areas almost come into focus but don’t quite get there. And a section at 100% magnification. Then through trial and error I worked out the cause of the issue. Take a look at the image below which was shot immediately after the image above. This time the image is pin sharp across the frame. And again, a section of the image at 100% magnification. Section of good image at 100% magnification. The cause of the issue was the Lee 0.3 ND grad filter I was using. With the filter on the lens, the images were out of focus and appeared shaky. With the filter removed the images were crisp and sharp. I could repeat the result time and again with all my Lee filters. What appears to be happening is that the filter is causing a problem for the autofocus mechanism in the XT2 and it continues to refocus as the shot is being taken. Later I turned off the autofocus and could focus manual to capture a pin sharp image. If I set the camera back to autofocus the problem occurred again. What I haven’t been able to work out is why I have only seen the issue with the telephoto lenses. My other lenses (10-24, 16-55 and 18-55) all work fine with my filters. This is one to watch out for if you are a landscaper and use filters. I was also wondering if anyone else has experienced a similar issue? Fuji XT2 + 16-55 lens. Trpiod mounted. 0.3ND grad + Polarising filters. Some of you may recall the problems I experienced when I bought my Fuji XT1 together with a couple of lenses. Th Fuji 10-24 was excellent but the 18-135 was quite poor. In the end, I returned the 18-135 exchanging it for a 16-55 new and a 55-200 used lens. The 16-55 is amazing but the 55-200 was a little odd. At first the lens seemed sharp enough but I never really had the chance to try it out properly. Once I did try it out, I didn’t pay too much attention to the images but I did notice my hit rate was poor, many seeming to display camera shake. Ultimately, I contacted Wex where I had purchased the lens and arranged with them for the lens to go back for repair by Fuji (I was a good month out of the 28-day refund period). The performance of the lens looks to have deteriorated over time even though I have hardly used it. It doesn’t matter if it’s hand held or tripod mounted and the shutter speed doesn’t have much effect on the results. It appears to overexpose a lot, lack contrast and it has soft spots, the location of which change. As you zoom to the longer focal lengths the focus issues seem to get worse but the severity varies. To give you an example of one of the more severe cases, look at the following. Example Image with the 55-200 Lens on a Fuji XT2. This is image was captured at f/8 with a shutter speed of 1/10”. The camera was tripod mounted and a shutter release used. It was part of a panoramic sequence and the entire sequence has the same strange focus issue where only the top left of the frame is in focus. In some later images, the entire frame is in focus except to the top left. Image section magnified. Click to view at 100%. Only the top left of the frame is in focus. My friend Steve has a theory about lenses such as these. He thinks that most people keep the good ones and trade the poor ones. I think he could be right. Whatever the reason, I hope Fuji can repair this. Daybreak on the island of Stromboli. Captured with the Olympus EM5. read the text to find out why. It’s now been a few weeks since I purchased the Fuji X-T1 and I think it’s fair to say it’s been a bit of a roller coaster in terms of how I have taken to the camera. But despite this it’s also been a huge learning experience for me and one that I am happy (now) that I have had. With this in mind I wanted to share some further thoughts about the camera in a few broad areas. The camera is very well thought out and handles perfectly, at least for me. All the dials and buttons are where I would like to find them on the body, allowing me to work quickly. I find the layout and operation largely intuitive but so far I am probably using only a fraction of the features. I tend to shoot in Aperture Priority mode and then use exposure compensation to correct the exposure. The only niggle that I have is that when I am changing the ISO dial, I sometimes catch the dial below this and set the camera to do multiple exposures or something equally annoying. With the EM5 this wouldn’t have bothered me as I tended to keep the ISO at the base 200. With the X-T1 I am much happier to push the ISO high for reasons I will mention shortly. The build quality of the camera gives a lot of confidence. I have heard some people complain the body is too light, but I would say it’s about right and is in line with the EM5 that was my main camera. The camera with lens attached is slightly larger than the EM5 and I probably need to find a new bag. I am struggling to fit a body and two lenses into my LowePro 140 which can take my EM5 and three lenses. I would say thought that size and weight of the Fuji kit is still acceptable as a travel and trekking camera. The lens range is excellent although not as large as the Micro 43 range. I really like the build quality of the lenses, especially the super wide angle 10-24mm. Although there are a couple of lenses in the Micro 43 range that offer similar focal lengths these won’t accept filters due to the front element protruding. As I rely on lens filters heavily to achieve good exposures, this makes the Fuji system a real joy to use. In the past I have tried the Micro 43 wide angles and then sold them because of the filter issue. Only the Olympus 9-18 remains in my kit as it will accept filters but it just doesn’t compare to the Fuji 10-24. It’s possible the 18-135 that I bought (and which has now been returned) was faulty. 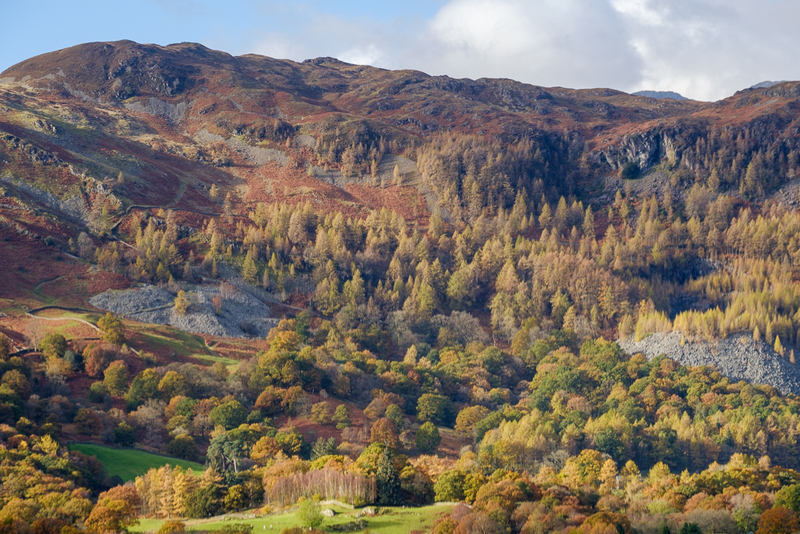 I experienced some focus issues with this lens as well as it appearing to exaggerate the watercolour effect (see below). Overall the lenses that I have give me a great deal of confidence in the Fuji system. I particularly like the Image Stabilisation in the lenses (although I would prefer it in the camera body). Despite this I seem to be able to shoot at some crazy shutter speeds handheld. Couple this with the excellent noise handling at high ISO (see image quality below) and you have a very flexible camera. It’s a real shame that the stabilisation is missing from the 16-55mm lens. The water colour effect is a problem with the Adobe software but you can improve the results with careful sharpening, noise reduction and contrast/micro-contrast adjustment. The feedback on the “Fuji RAW File Conversion Challenge” was very insightful. 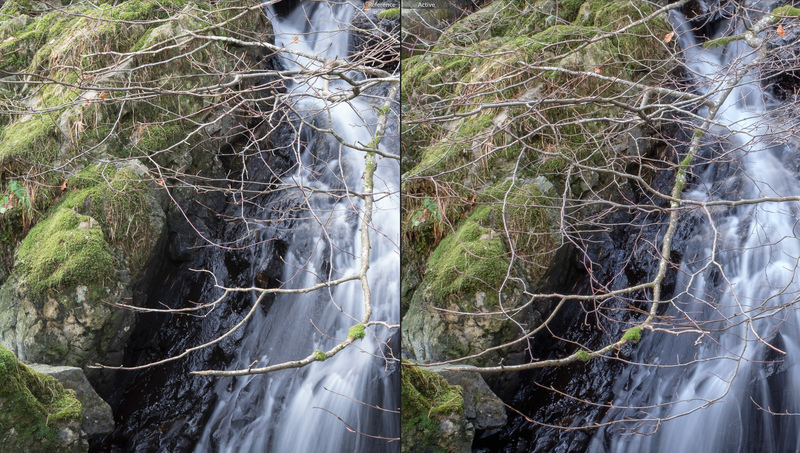 There are a number of factors that seem to exaggerate the water colour effect as mentioned below and you should try to minimise these in your shooting. This includes camera shake and getting the depth of field/focus point wrong. Poor lens performance appears to exaggerate the Adobe water colour effect problem. Remember, lenses may not perform well across their entire focal range and aperture making the problem more difficult to pin down. The water colour effect can be hidden if you are working on a screen with a high pixel density. If you are using a large screen with such as a 24” screen in HD resolution (1980 x 1020) you will likely see it much more than if you were using a 27” 5K Mac screen. There are some great RAW converters out there which do a superb job of decoding the XTrans RAW file. Both Iridient and RAW Therapee produce better results for me than Adobe software, with fine detail being preserved and not becoming blocky. The Adobe software also appears to introduce a false pattern in distant foliage and which these other RAW converters avoid. The images are very clean with noise not being evident. Even when I am shooting at ISO800 I have can happily turn off the noise reduction (Luminance and Colour) in order to better preserve fine details. The RAW files are very flexible and stand up well to heavy processing. You are able to recover significant amounts of shadow and highlight detail without causing noise or other issues to become evident. Colours are excellent and the film simulations supported in Lightroom are superb although sometimes a little contrasty. It’s therefore best to apply these first if you are using Lightroom. I also recently discovered that the Iridient RAW converter has its own version of these simulations which are also good and can be applied to other camera RAW files, not just Fuji. Last week I took a bit of a break and went to Italy to hike up a few volcanoes. I decided not to take the Fuji as it was a little heavier and bulkier than the EM5. Overall I had the feeling the EM5 was a little like a toy camera in comparison to the Fuji. This is despite me having loved the EM5 for over three years. Now I am back and looking at the images I have captured, the RAW files don’t feel as flexible when applying image adjustments. I can also see much more fine noise in the images than with the Fuji RAW files, even when the EM5 is at base ISO. In summary, I’m now sold on the Fuji. The only question now is do I carry out the rest of my plan to buy the Fuji X-T2 when its released? I’m really tempted by the increased pixels but would I be better upsizing the X-T1 images?